Send a beautiful expression of your love and concern at this difficult time. 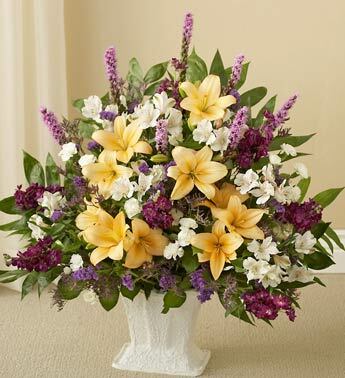 Arrangement consists of the freshest lilies, statice and caspia. This particular style of floor basket arrangement is sent by family, friends or business associates. Generally delivered to the funeral home. Due to the urgency of the occasion, only the freshest flowers available, so colors and selection may vary.